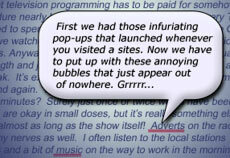 I'm getting seriously fed up with pop-up adverts and in particular those bubbles that suddenly appear when you're mouse pointer moves over a link. First we had those infuriating windows that would automatically be opened whenever you visited a site, and in extreme cases they would spawn a dozen windows when you click on a link. These days we have to put up with obtrusive adverts everywhere and my personal gripe is these IntiliTXT bubble ads that suddenly appear in the text. They're so annoying and distracting. Yes I know you can change the security settings and implement various ad blockers etc., but I don't want to cripple my browser and install lord knows what just so I can read the text of an article in peace. Static adverts in the corner, animated cartoons and videos are one thing, at the end of the day you know they are there and you can ignore them, but these are intrusive! These hovering bubble ads actually get in the way of the text whilst you are in the middle of reading, spoiling the user experience. Quite often the link has a dotted underline, sometimes a double underline and woe betide the foolish surfer that casually grazes his or her mouse down the screen as they are reading. Do the people who design these websites not think about how the user interacts with their pages? People browsing the web aren't known for their patience and if you distract or annoy your visitors, you're going to loose them very quickly indeed - and they won't come back! Equally as annoying as the bubbles are the boxes that just slide across the screen and get in the way, or the ones that open up in a modal fashion disabling the page you were just about to read. Sometimes they have a pretend button with an "X" in the top right-hand corner that looks as though it could be used to close the window. Clicking on this is fatal as it usually launches another window that will confirm your worst fears. You are in fact in hell because you've probably forgotten what you were looking for by the time you have the beast under control again! Okay, rant over. I'm off to use DOS Lynx or some other text based browser now, because I've had enough of all these annoying adverts getting in the way! Old gripe I know, but another really annoying thing are those adverts that follow you down the page. You know the sort; it usually seems to be newspaper articles with one each side and as you scroll down the page the adverts move down with you. Don't they realise how off-putting these things are? For Internet Explorer, very easy. Yep. Darned silly webmasters. I'm with you all the way. Lynx rules. Try Links, another character mode browser which handles tables differently. Links renders tables in columns across the width of the terminal. Lynx doesn't do that. I agree it shouldn't be necessary to install blockers such as Disable Intellitxt. Have to laugh at the other commenters below who seem to assume the poster "I want to read the story" is running Windows. The gripe mentioned Lynx which is for POSIX style systems such as UNIX, GNU/Linux and Mac OS X. Though it is possible to run Lynx on Windows in Cygwin. Get an old PC and stick dansguardian or some other proxy on it. That you can can completely block all adverts and by URL AND domain! Also out there: hostsman and hosts server (Abel Digital). Oh, and use Firefox! Beware ... press Alt+F4 quickly ... and do not keep them pressed or you can get rid of the menu you are looking at. Lynx rocks! Unfortunately most sites don't alt.text their graphics any more. I find using a graphical browser from circa 1999 is the trick. Arachne, Opera, early Netscape. Also there is a beast known as a "LiveCD", which doesn't even use your hard disk - surf away, let the viruses do their worst, then turn it off and on again and everything is hunky dory. Brilliant.